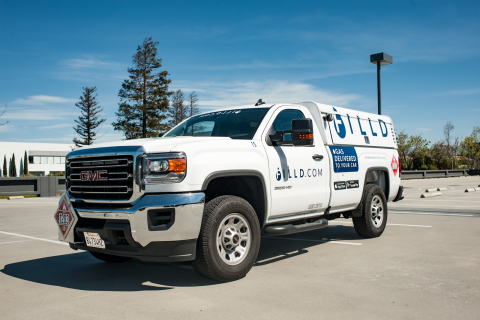 MOUNTAIN VIEW, Calif.--(BUSINESS WIRE)--Filld, the last mile mobile fueling company, announced today that it raised $15 million in Series B funding co-led by Parkland Fuel Corporation (“Parkland”) and Calibrate Ventures with participation from previous investors, including Cendana Capital, Lucas Venture Group, Javelin Venture Partners and Hallador Investment Advisors. Parkland is Canada’s largest and one of North America’s fastest growing independent marketers of fuel and petroleum products and a leading convenience store operator. The funding signals growing support for mobile fueling as traditional retail gas stations navigate changing mobility trends, such as shifting vehicle use patterns, the rise of on-demand and shared vehicles, connected cars and autonomous fleets. Increasingly, consumers and businesses are demanding more flexible, cost-effective fueling services and, as market demands shift, Filld’s technology platform and equipment can easily transition to support alternative fuel and electric vehicles. Filld will use the funding to drive new market expansions, further extend services within existing markets and enhance its tech platform and connected architecture. Filld also announced today the expansion of its consumer service for customers in the Washington, D.C. metro area, where the company already provides commercial and fleet mobile fueling for partners like Daimler’s car2go (the largest one-way carsharing service in North America, with over one million members in the U.S. and Canada). The service expansion signifies the continued success of Filld’s customary approach to entering new metros — focusing on large connected commercial and fleet services, then expanding to offer consumer service while ensuring operational safety and the best possible customer experience. Filld is rapidly hiring today and has significant plans to ramp-up recruiting and training for new jobs across North America (from fleet mechanics to delivery technicians). Founded in 2015, Filld is a flexible, safe, scalable last mile infrastructure company that delivers fuel to customers’ vehicles, so they never have to stop for gas again. Filld currently serves consumers in the Bay Area and Washington, D.C., and offers commercial and fleet service in the Bay Area, Seattle, Portland and Vancouver, Canada. Top Filld partners include Daimler car2go, Volvo, BMW ReachNow and Sixt. Commercial-rated Filld drivers in safety-compliant Filld trucks have pumped millions of gallons of fuel without a single major safety incident while delivering top-quality, double-filtered gas sourced from premium brands, like those brands carried by Parkland Fuel Corporation. Calibrate Ventures is an early stage venture capital firm investing in the areas of Connected Platforms, Consumer, and Enterprise SaaS. Prior exited investments made by the partners include Chegg, Dollar Shave Club, Ring, ServiceMax, SolarCity, and VictorOps. Current investments include Alpha, Built Robotics, and Soft Robotics. For more information, please visit www.calibratevc.com.